In the debut episode of the View 902 Podcast, Paul Kimball chats with historian Aaron John Gulyas. 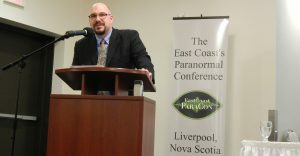 They cover an eclectic range of subjects, including the strange life and times of Albert K. Bender and his role in creating the Men In Black mythos (the subject of Aaron’s presentation at the 2016 East Coast Paraconference in Liverpool, Nova Scotia back in early August), why people gravitate towards the Extraterrestrial Hypothesis as the go-to explanation for UFOs, Ornette Coleman as a metaphor for consciousness, and some 19th century American history, including a debate over who really won the War of 1812. They also field a couple of questions from a message forum on The Paracast radio show, and conclude with a shocking revelation about President-elect Donald J. Trump. You can find Aaron on-line at his website, History, Teaching and the Strange.